We was established in 1993. 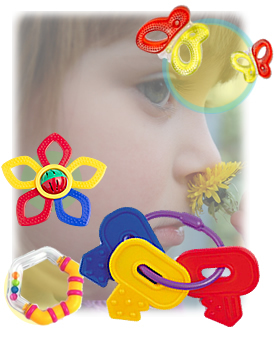 We are specialist in produce plastic baby items, such as rattle, ring, hooks, teether, pacifiers, plastic clips, water teether, baby bottle, sound module, spoon, feeding items, non spill cup, rattle handle, mobile, plastic clock, book plastic accessories and plush accessories. We has been marketing its products in world successfully under brand name "Playgro", "Lamaze", "Haba", "Babymoov", "The First Years", "BRUIN", "Manhattan Toy", "NUK"..........etc. OEM are welcome. We was passed the certificate ICTI, GSV and CQC. We is a leading manufacturer of plastic and electronic baby items, will be one of your best business partners in the world.